Yews and Alberta Spruce are the most susceptible to winter wind and sun burn. It is, therefore, advisable to keep these plants wrapped with burlap from top to bottom, beginning in the late fall. Never use plastic as a wrap – even in the winter months plants must be able to “breathe.” Evergreens should be well-watered before the severe ground frost of mid-December to guard against desiccation (drying-out) caused by cold winter winds. Wrap burlap around cedars and evergreens that are exposed to wind. Again, a reminder, the last 2 winters have been quite the winters where plant damage was concerned. Two layers of burlap around all evergreens will help to prevent snow damage (from the weight of snow), salt spray (from the melted snow on a nearby road, especially on the east side of the road) and sun scald in late winter (when the sun reflects off a clean, white layer of snow onto evergreen foliage). Upright evergreens, such as Junipers and Cedars suffer the most damage from the weight of snow on their branches. This will not usually kill the plant, but can make it unsightly the following year. The best protection is to cover the juniper with netting. Apply in late fall and leave on the plant until the threat of snow has passed in early spring. These plants are very susceptible to wind, sun and snow damage through the winter months, especially if they have been planted in an unprotected location. Be sure to cover the root area with up to eight inches of mulch. Then build a shelter around each plant with burlap and stakes to keep out the wind and the sun. Make sure the soil around the plants is moist going into the freeze, the more moisture available to them over the winter, the better. Similar to Rhododendrons & Azaleas, these plants are very susceptible to wind, sun and snow damage through the winter months, especially if they have been planted in an unprotected location. Build a shelter around each plant with burlap and stakes to keep out the wind and the sun. Be sure to water really well going into the winter freeze – keep watering until the ground freezes. This is liquid magic on boxwood, yews, cedars, euonymus, rhododendrons and other evergreens that are exposed to wind and road-salt-spray. Wilt-Pruf is an ‘anti-desiccant’ that provides an invisible layer of protection to all broad-leaved evergreens through winter. The humidity in our winter air drops to less than 10% some days, causing the moisture in the foliage of tender evergreens to evaporate. The result is browning in the extreme. AND…your Christmas tree will benefit from an application of this too, reducing needle drop and fire hazard. Cut your roses back approximately 1/3 by removing all frozen buds after the first heavy frost. Remove all leaves as much as possible and dust the lower branches with a general fungicide. Using a rose collar, build fresh garden soil 2′ high around each rose bush – cover as much of the rose as possible. Do not use manure, peat moss or other material high in organic matter (ie, compost, straw, leaves etc.). Climbing roses should be pruned only very slightly in the fall by removing the frozen buds and tips of the most tender growth. The branches of climbing roses should be tied together and wrapped in burlap. Never use plastic. Build up soil around the roots the same as for other roses. The last mowing should be done very close to the ground and the clippings raked away. This will prevent fungal diseases from destroying grass roots over the winter. Water, Water, Water! It is very important to continue to water until the ground freezes. Plants need moisture in the ground to get them through the winter. If we have a long winter like we have had for the past 2 years, plants rely on the moisture to keep their leaves from drying out too much (winter injury and burn will be much worse on dry plants). Now is the time to trim your hedges and evergreens. 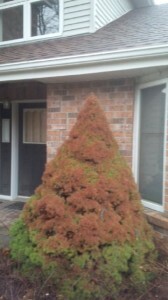 You want to finish trimming your evergreens before it freezes as it could cause injury to the foliage. 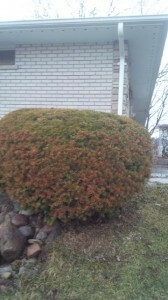 If you don’t want to trim your evergreens and hedges, or you can’t – we can! Fill out our online request form to request a free quote! If you don’t have plastic spiral collars on your trees, put them on now! These quick, simple, economical little guys will save your trees from rodent and animal damage. Put them on all your trees – Japanese Maples, fruit trees, shade trees etc. You’ll be thankful in the spring that you did this! Leaves are garden gold. Spread small leaves of trees, such as locust, birch, beech, serviceberry and silver maple (or shredded larger leaves), over all exposed soil. They will degrade into mineral nutrients and worms will turn them into fertilizer. Squirrels “read” the disturbed soil and marks you leave when planting their favourite tulips and crocuses. Outwit them by concentrating spring bulb plantings in large groups and disguising your marks by flooding the soil surface with water. Then cover them with 5cm (2 inches) of leaves and blood meal. You can also cover sections of bulbs with chicken wire – the bulbs can grow through it, but squirrels can’t relocate them on you. If you would like to overwinter any tropicals indoors be sure to bring them in before it gets too cold (anything under 10 degrees Celsius). Be sure to spray them with an insecticide to kill any pests that are hiding, and trim the plant back. Keep in a bright room, keep it from drying out (you want the top inch of soil to be dry before you water it again) and fertilize once a month. Most plants will defoliate because you have moved them into a different climate but they will push out new leaves again once it is acclimatized to your home. This entry was posted in landscape, lawn, natural, seasonal, to do and tagged autumn, bulbs, burlap, evergreens, fall, fall maintenance, flowers, garden beds, garden maintenance, gardens, georgina, georgina garden centre, hedge trimming, how to, keswick, landscape, lawn, lawn maintenance, natural, outdoors, overseeding, overwintering, pruning, roses, shrubs, to do, winter, winter wrapping, wrapping shrubs on October 8, 2018 by Online Graphics. ‘Tis the time of year for buying new soil for your yard, garden and pots (indoor and out), so what better time to learn the difference between the different types of soil we offer! Many people don’t know that there is a difference between types of soil and that it really does matter what type of soil you use for different projects. I think some of it has to do with the fact people are trying to save a buck and a bit of their time, as both are hard to come by, and if they just get one type of soil it will save them time and money. Besides, soil is soil, right? NO! I always say to customers, you’re spending the money on the plant buy the right soil for it otherwise it all is a waste of time and money! There are also quite a few people that don’t know that the problem they’re having is because of their soil (their plants keep dying or not preforming how they’d like them to)! Top soil is straight soil with nothing mixed with it. It is good for using under sod and any other lawn application. It can be used for topdressing but topdresser is better and easier to apply. Do not use top soil in pots. Triple mix is made up of: top soil, manure and peat moss. It is good for planting in the ground and can be used throughout the garden. Triple mix helps to break up heavy clay soils and is good to add to sandy soils. Do not use triple mix in pots. Good garden soil contains a combination of: black soil, organic matter, peat moss and horticultural sand. Garden soil can also be used on the lawn. Don’t limit your lawn soil to just top soil or topdresser, your grass needs as much rich nutrient soil as your garden does! Garden soil is heavier than potting soil, retains some moisture, and has less air space than potting soil. Do not use garden soil in pots! As the name states: potting soil is for pots (and containers). Good potting soil is usually soilless with a combination of: organic matter, perlite, vermiculite and horticultural sand. It is light and holds water well and has great drainage. There should be a lot of air-space in it. Buying soil with fertilizer already in it is not necessary and could be a waste of the few extra dollars it costs. If you have container grown before, you would have noticed that when you water your pots, a lot of water comes out the bottom, so does all the nutrients. Buying a good quality potting soil and fertilizing regularly is sufficient for your container plants for the season! This entry was posted in Indoor, landscape, natural and tagged container gardening, fertilizer, fertilizing, flowers, garden beds, garden maintenance, garden soil, gardens, georgina, georgina garden centre, grass seed, healthy lawn, horticultural sand, keswick, landscape, lawn, lawn maintenance, natural, organic matter, outdoors, overseeding, perennials, perlite, planting, plants, pots, potting soil, shrubs, soilless, top soil, topdressing, triple mix, vermiculite on April 5, 2018 by Online Graphics. Here we are, the snow is finally gone and with it the wool socks, the time has come to sharpen your trowels and come up with a game plan for spring garden season. While we are still some time away from sowing seeds and planting outside, there are a few things you can do to get a leg up on the coming season. Lets get out there and get started on what will be another great season. This is a perfect time to get out there and start shaping your trees and shrubs. Beyond the esthetics there are many practical reasons to get pruning especially with your fruit trees. Proper pruning helps to increase the size and quality of your blooms, foliage and fruit by allocating plant resources. Increase the plants health by removing damaged, dead or diseased limbs. Control and direct the plants growth and get rid of any criss-crossing branches. Compensate for root loss after transplanting. Improve air circulation and light penetration. It is important to thin out dense growth periodically to increase overall health and shape. Leader management. Manage the direction and shape of growth by pruning the leading branch of the tree or shrub. Creating a focal point or landscape feature. Create more space by pruning back, or thinning out plants. Expose colorful, textured or shapely stems and bark. These pruning basics apply to all the common fruit trees we can grow in our zone (zone 5) – apples, pears, plums and cherries. After pruning apply Lime Sulphur & Horticultural Oil in combination to protect your fruit trees. Early spring is the perfect time to apply the combination spray to your fruit trees, before the buds break (open). Both the sulphur and oil protect your trees from a variety of insects and diseases that can damage the tree and inhibit proper fruit growth. Applying the lime sulphur & horticultural oil is easy; simply spray it on the tree’s stem and branches putting a fine layer on all surfaces. Note the oil stains so be cautious around concrete, decks, houses and clothing. For more on Lime Sulphur & Horticultural Oil read the directions on their containers. You can continue to use the sulphur throughout the growing season (as long as the tree isn’t in bloom – you don’t want to interfere with the bees and insects pollinating) if you see any insects or disease on your trees. However, we suggest to only use the oil in the spring before the buds open as oil on the foliage could burn when leafed out. Proper maintenance of fruit trees will leave you with bigger and higher quality produce so a little elbow grease now will pay dividends by harvest time. Remember, gardening is fun so lets get out there and enjoy ourselves! This entry was posted in fruits & veggies, natural, trees and tagged apple, blooms, cherry, do it yourself, dormant oil, Fruit tree pruning, Fruit tree spraying, garden maintenance, gardens, georgina, georgina garden centre, grow your own, horticultural oil, how to, keswick, landscape, lime sulphur, natural, natural pest control, pear, pest control, plants, plum, pruning, spring, spring maintenance, spring pruning on March 22, 2018 by Online Graphics. When planting, transplanting or dividing plants it is vital to use a transplant fertilizer. We use Acti-sol Transplater 4-10-2. It is made of pure hen manure and bone meal. It is ideal for planting and transplanting all types of plants as the hen manure acts rapidly to stimulate root development and the bone meal breaks down slowly for medium and long term action. A plant will not push any crown growth until it is firmly established. You can plant at any time of the year, as long as you can dig a hole (so you can’t plant when the ground is frozen). The most important thing about planting is watering – and not just watering once…water, water, water – water lots especially during the plant’s first year. Trees need up to 15 gallons (that’s 57 litres) of water a week, shrubs need up to 10 gallons (that’s 38 litres) a week. The easiest way to water is taking a 5 gallon pail, drill a couple of holes in the bottom, set it beside the plant you are watering, and fill it up – it will slowly empty, giving the plant a nice deep water. Repeat this a few times a week depending on how much water your plant needs. This is a great video on how to water using the bucket method. Also, keep watering your plants until the ground freezes. Plants need nice moist roots going into the long dry winter. Transplanting plants is a little different than planting potted plants. When transplanting, for the most part, we do not want to move the plant while it is in bloom or during it’s growth time. Move the plant either really early spring or late fall (depending on it’s blooming and active growth time). It is expected that there will be some root loss and damage when moving a plant so plants moved in the heat of summer is discouraged. Damaged roots will not always be able to absorb sufficient water for the whole plant so cutting back the tops is sometimes necessary to keep it hydrated and cool – if possible try to move the plants in cooler wetter weather. Transplanting offers the ability to redesign your gardens without having to buy any new product. A fresh new look, accentuating different plants and bringing attention to some of your more hidden specimens at a moments notice keeps your yard looking fresh and new. As a rule of thumb divide and move perennials in the cooler weather and remember: spring bloomers in the fall and fall bloomers in the spring. Dividing perennials is a rewarding though finicky gardening adventure. Dividing plants is a great way to scale back some of the more vigorous growers keeping your garden from looking overgrown and unkempt. It is good for controlling plant growth, smaller plants are most often more vigorous bloomers than their larger leafier selves. When managing our gardens that is our goal, emphasis plant blooming and manage our space. When using a spade to separate clusters use rubbing alcohol to clean the spades cutting edge to reduce the risk of disease transmission. Below is a great article on dividing perennials: when, which ones and how. Check it out! Check out our video on dividing hostas – the general concept of dividing hostas can be used on many other perennials as well. This entry was posted in perennials and tagged dividing, fall maintenance, fertilizing, garden beds, garden maintenance, gardens, georgina, georgina garden centre, how to, keswick, landscape, outdoors, perennials, plants, spring, spring maintenance, to do, transplating, watering on February 27, 2018 by Online Graphics. Spring has come and it is time to get out there and get your yard ready for the coming season. A proper spring clean up will set up your lawn and garden for greater success throughout the growing season. 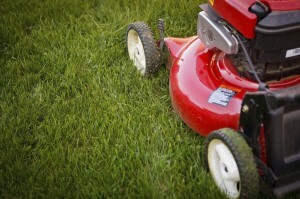 There are a number of things you can do to get your lawn and garden ready. Doing these few things will provide you a great deal more success with your garden in the months to come. A beautiful thick green lawn starts in the spring with the proper spring care and maintenance. This entry was posted in landscape and tagged aerating, fertilizing, garden beds, garden maintenance, georgina, georgina garden centre, grass seed, landscape, lawn, lawn maintenance, overseeding, plants, pruning, shrubs, spring, to do, top soil, topdressing on April 8, 2017 by Online Graphics.